I know! I know! I was suppose to post this last Sunday but I've been so busy with work (I've been uhhh "detained") and preparing for the joint celebration of my dad and sis that I just could not squeeze two challenges in. 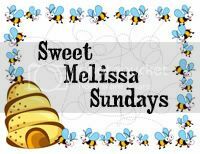 I'm grateful that our leader over at Sweet Melissa Sundays is so understanding and nice. Thanks Lorelei. Now on to my first Sweet Melissa Sundays Challenge, Bear's Peach Cobbler. I've never had cobbler before. I've never made cobbler before but it was surprisingly easy to make. The recipe calls for fresh peaches which I of course didn't have so I used canned peaches instead. I had to drain the syrup though and reduced the amount of sugar called for in the recipe. After baking in the oven for an hour and thirty minutes, I let it cool a bit and then dug in with a spoon. The filling was moist and you can taste the cinnamon but my favorite were the biscuits. The biscuits were delicious and tender. Very tasty thanks to the addition of the lemon zest. Maybe I can use the cobbler topping as the base for my lemon bars. Wow.. This looks SOOOOO yummo!